The terrain of Mars is treacherous, especially if you're a lonesome rover quietly scouring the Martian surface. It doesn't have to be this way. Although a rover like Curiosity is well-equipped to tackle rocky terrain, NASA wants to send a team of scout companion helicopters to make exploring the Red Planet that much easier. Not only will these drones scope out safer areas for rovers to travel, but it'll give scientists a bird's eye view of what's around, making it much easier to identify points of interest. On Mars, there are no FAA regulations for drone usage. NASA made a fascinating Bill Nye-style video talking about whether a drone could actually fly on Mars. The short answer: yes. But it's much more complicated than that. Because Mars has 100 times less atmosphere than here on Earth, it becomes much harder for objects with rotors to produce lift. For a drone, that means spinning the rotors at a much faster rate, which isn't an easy thing to do given how big these drones are going to be—about 2.2 pounds, with a blade diameter of 3.6 feet. 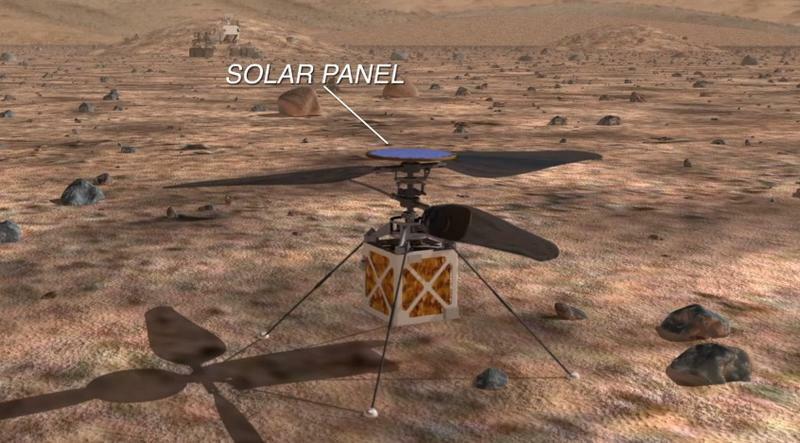 There are a number of challenges when trying to produce lift on Mars, chief among them includes accounting for the atmospheric density, creating a drone that's durable enough to withstand the harsh conditions on Mars, and also one that can repeatedly take off and land. NASA's drone idea is very early on in terms of design, and it's unlikely Opportunity or Curiosity will get companion drones in their lifetime. But the agency is very intent on sending more rovers to the planet in the future, which means we could get some truly spectacular photos and video by the time drones are scouring the planet's surface.